Just before the world gets a full look into Stevie Stone’s life with Rollin’ Stone, HipHopDX.com has premiered the WillPower-laced “Dollar General” featuring Shady Records’ own Yelawolf. 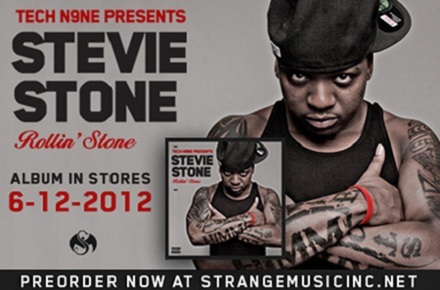 The brand new track, taken from the forthcoming Rollin’ Stone, finds Stevie Stone in the middle of a true crime story as he envisions the events that have him “living on the edge”. Assisted by an addictive and gritty hook from Yelawolf, “Dollar General” gives listeners another side of Strange Music’s newest contender. Listen to “Dollar General” featuring Yelawolf and be sure to pre-order your copy of Rollin Stone! Click here to listen to “Dollar General” on HipHopDX.com. What did you think of “Dollar General”? Would you like to hear more collabs between Strange Music/Shady Records?